When I was still a student at the Graduate Institute of Taiwan Literature, an American professor came to visit one of my professors and, as one of the two resident foreigners in the department, I was enlisted to see what it was he wanted over dinner. 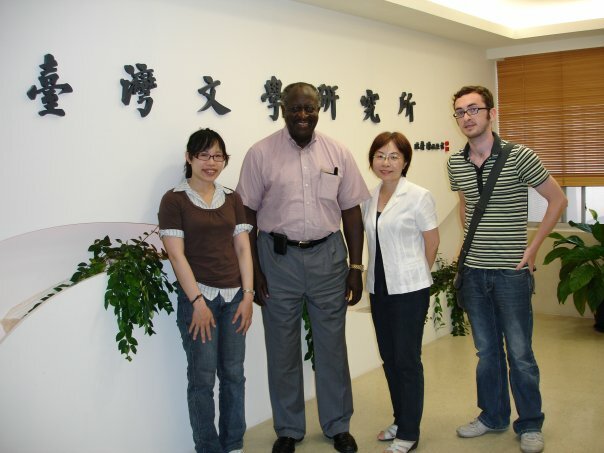 The professor was Maurice A. Lee (see picture second left) and he was hoping to organize a conference in Taiwan, unfortunately our research institute didn’t have the funds to make it happen, but we had a nice chat. The face changer had been born without a face. His mother said that he’d wanted it that way. Back when he was in his mother’s womb, she was unable to make him whole, and he had to face the world lacking. The only favor his mother granted him was helping him decide which part of his body to go without. Floating in his mother’s amniotic fluids like a corpse, he saw his arms, his two feet, and his body, he felt reluctant to part with the bits he’d already seen, but that only left his face, the only thing he couldn’t see, after his tacit response to his mother’s question, he cried out, and then came into the world. He scared the doctors and nurses in the room when he was born, each of them guessing as to what the child would look like when he grew up. This would be the reason that he would later change his face so much, but it wasn’t because he wanted to shock everyone, with a face that could never be pinned down, but rather that he wanted all their guesses to come true, to satisfy all of their imaginings. Before his face-changing days, back when he was young, he faced a lot of challenges. His mother was worried that he’d scare people, so she drew a face for him. Lacking in imagination as she was, however, the eyes, nose and mouth she drew were those from your average picture book, his features all curved in shape, with eyes like rainbows, and a mouth like an upturned rainbow. If his mother had remembered, she would have drawn a little dot for his nose too. Wu has won numerous awards including the United Daily Press Literary Award for Fiction, the China Times Literary Award for Fiction and Essays, the United Literature Monthly Literary Award for Fiction, and the Liberty Times Lin Rungsan Literary Award for Short Essays. He published his new collection of essays, Motorbike Days (《機車生活》), in 2014 and is now a PhD candidate at the Institute of Chinese Studies at the University of Heidelberg in Germany and regularly reports the latest German literature news for Taiwanese magazines and newspapers. Still working on reviews, not given up on the blog, expect more content soon. This entry was posted in Book Reviews, Book Reviews: Taiwanese Authors, Comments and Feedback, Home, My translations, Taiwanese authors, Translations, 中翻英 Chinese to English and tagged 短篇小說, 臺灣, 臺灣文學, I-Wei Wu, Maurice A. Lee, Motorbike Days, short stories, short story, taiwan, Taiwan Literature, Taiwanese, The Face Changer, Unbraiding the Short Story, Wu I-Wei, 台灣, 台灣文學, 吳億偉, 換照者, 機車生活, 中文小說 by ladenframe. Bookmark the permalink.